The Albizzini Palace dates from the second half of the fifteenth century, has a total area of 1660 sqm divided into three floors and has a footprint of Renaissance Florentine influence. 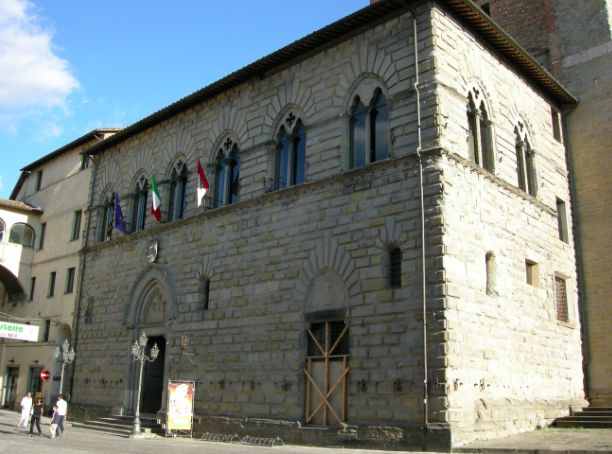 The building was acquired by the Cassa di Risparmio di Città di Castello who promoted the restoration, and was then delivered for free loan to the Foundation. In the restoration of the monument, (curated by architects Alberto Zanmatti and Titian Sarteanesi), arrangements have been made that have allowed the recovery space, and together the exhibition destination. The finish plaster sand and lime polished to trowel donated to the location (previously affected by repeated interventions of reuse) an homogeneous appearance, enriched by the elements in gray stone. The Palace is now the seat of the Foundation Albizzini Palace Collection Burri, named Burri Foundation, founded in 1978 by the same painter Alberto Burri, with an initial donation of 32 works. The Foundation organizes conferences and lectures on ancient, modern and contemporary art, as well as oversee the publication of catalogs and the organization of exhibitions of Alberto Burri.